, a celebrated naturalist, the pupil of Linnæus, and the friend of sir Joseph Banks, was a native of the province of Nordland in Sweden, where his father was minister. He was born Feb. 28, 1736, and studied at Upsal, where he appears to have taken his degree of doctor in inedicine. Linnseus, who during his residence in England, had formed an intimacy with Mr. Peter Collinson, advised his pupil to visit England, and probably recommended him to that gentleman. 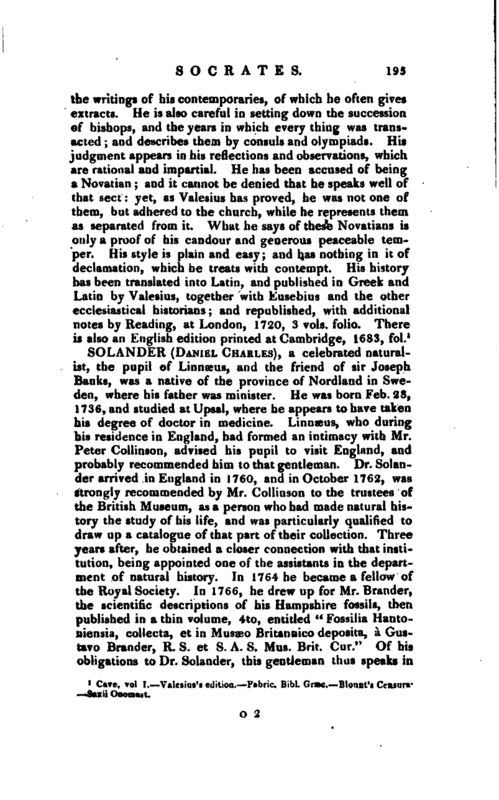 Dr. Solander arrived in England in 1760, and in October 1762, was strongly recommended by Mr. Collinson to the trustees of the British Museum, as a person who had made natural history the study of his life, and was particularly qualified to draw up a catalogue of that part of their collection. Three years after, he obtained a closer connection with that institution, being appointed one of the assistants in the department of natural history. In 1764 he became a fellow of the Royal Society. In 1766, he drew up for Mr. Brander, the scientific descriptions of his Hampshire fossils, then published in a thin volume, 4to, entitled “Fossilia Hantoniensia, collecta, et in Musseo Britanmco deposita, a Gustavo Brander, R. S. et S. A. S. Mus. Brit. Cur.” Of his obligations to Dr. Solander, this gentleman thus speaks in | his preface: “And now I think I have nothing more to do, than to acknowledge myself indebted for the scientific description of them to the learned and ingenious Dr. Solander, one of the officers of the British Museum, who is at this time employed by the trustees to compose a systematical catalogue of the natural productions of that entire collection.” It does not appear that this catalogue was ever completed. 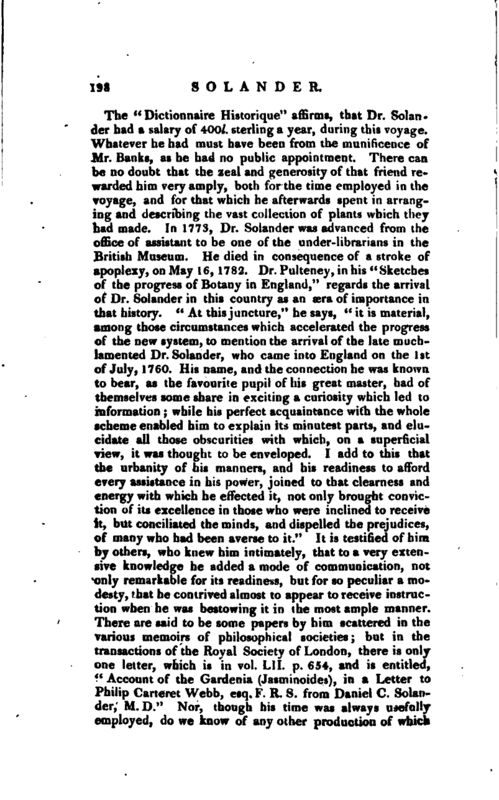 In 1768, Dr. Solander was prevailed upon by his friend Mr. (afterwards sir Joseph) Banks, to undertake the voyage round the world, in pursuit of discoveries in natural history: and permission was obtained for him from the trustees of the British Museum, still to hold his appointment during his absence. 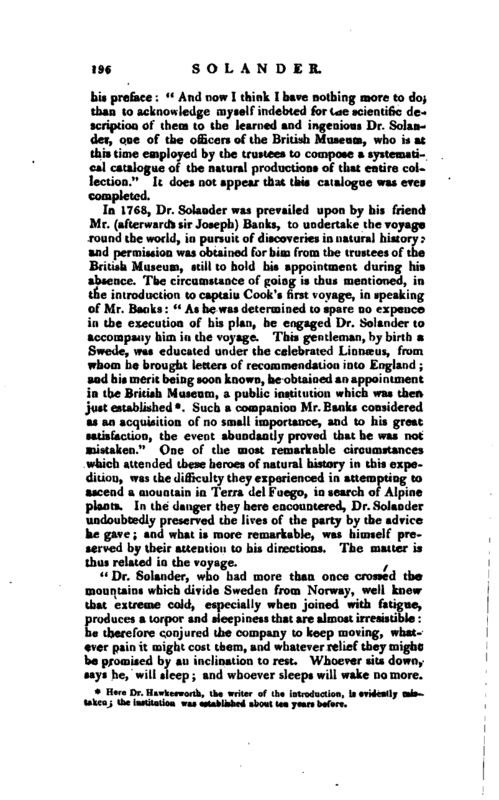 The circumstance of going is thus mentioned, in the introduction to captain Cook’s first voyage, in speaking of Mr. Banks: “As he was determined to spare no expence in the execution of his plan, he engaged Dr. Solander to accompany him in the voyage. This gentleman, by bi th a Swede, was educated under the celebrated Linnæus, from whom he brought letters of recommendation into England and his merit being soon known, he obtained an appointment in the British Museum, a public institution which was then just established*. 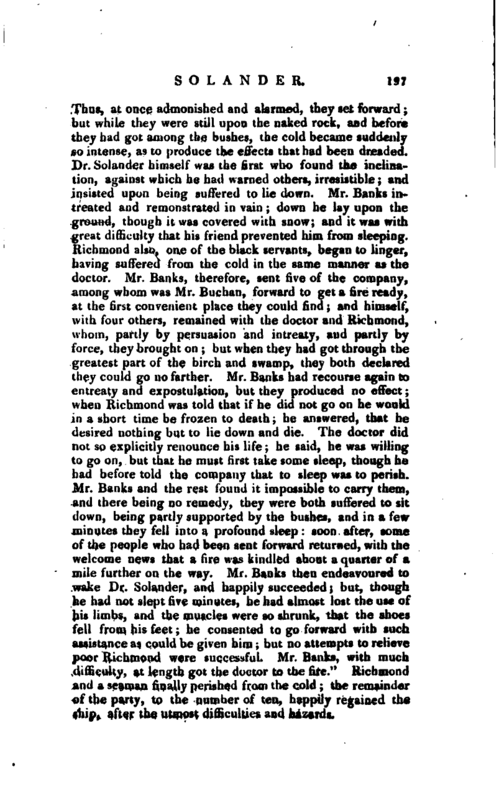 Such a companion Mr. Banks considered as an acquisition of no small importance, and to his great satisfaction, the event abundantly proved that he was not mistaken.” One of the most remarkable circumstances which attended these heroes of natural history in this expedition, was the difficulty they experienced in attempting to ascend a mountain in Terra del Fuego, in search of Alpine plants. In the danger they here encountered, Dr. Solander undoubtedly preserved the lives of the party by the advice he gave; and what is more remarkable, was himself preserved by their attention to his directions. The matter is thus related in the voyage. “Dr. 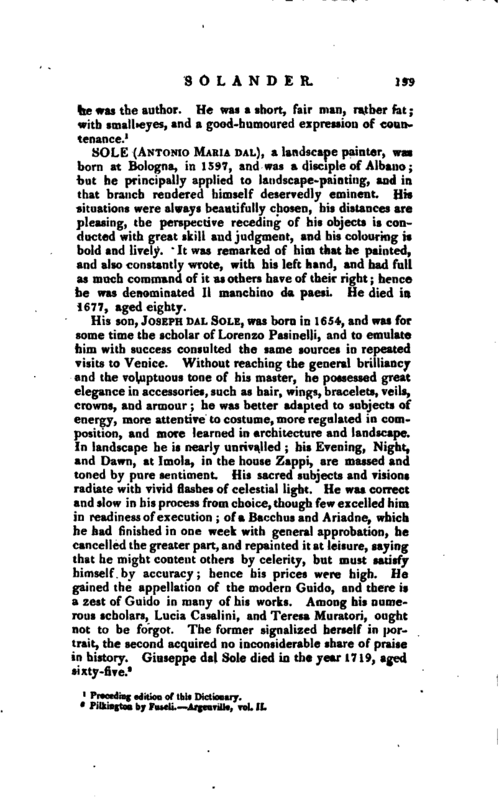 Solander, who had more than once crossed the mountains which divide Sweden from Norway, well knew that extreme cold, especially when juined with fatigue, produces a torpor and sleepiness that are almost irresistible: he therefore conjured the company to keep moving, whatever pain it might cost them, and whatever relief they might be promised by an inclination to rest. Whoever sits down, says he, will sleep; and whoever sleeps will wake no more. Here Dr. Haukesworth, the writer of the introduction, is evidently mistaken; the institution was established about ten years before. Preceding edition of this Dictionary.